Craw Daddy Boiler is your go-to party caterer. Make your party unique and interesting with a crayfish boil! Since 2013, Craw Daddy Boiler has been serving authentic Louisiana crayfish boils, Dungeness crab boils and Maine lobster boils in backyards all over Los Angeles. We take a southern classic and make it our own using only local produce from farmers markets around the LA area to ensure you are getting the freshest, highest quality meal possible. A crayfish boil is the perfect summer backyard activity and here in LA it's always summer! Contact us and book your boil today! Or fill out this form and we will contact you shortly. All of our crayfish comes from Louisiana and is shipped live overnight to ensure they are still fresh and kicking. We can get crayfish most of the year, but they are biggest in the summer and early fall months. We always use large live Maine lobsters to ensure quality and freshness. Our lobster boils are served with lemon butter sauce as well as our classic remoulade. The portions are very generous, with each guest getting a half lobster! Our Dungeness crabs are caught off the North-West coast. 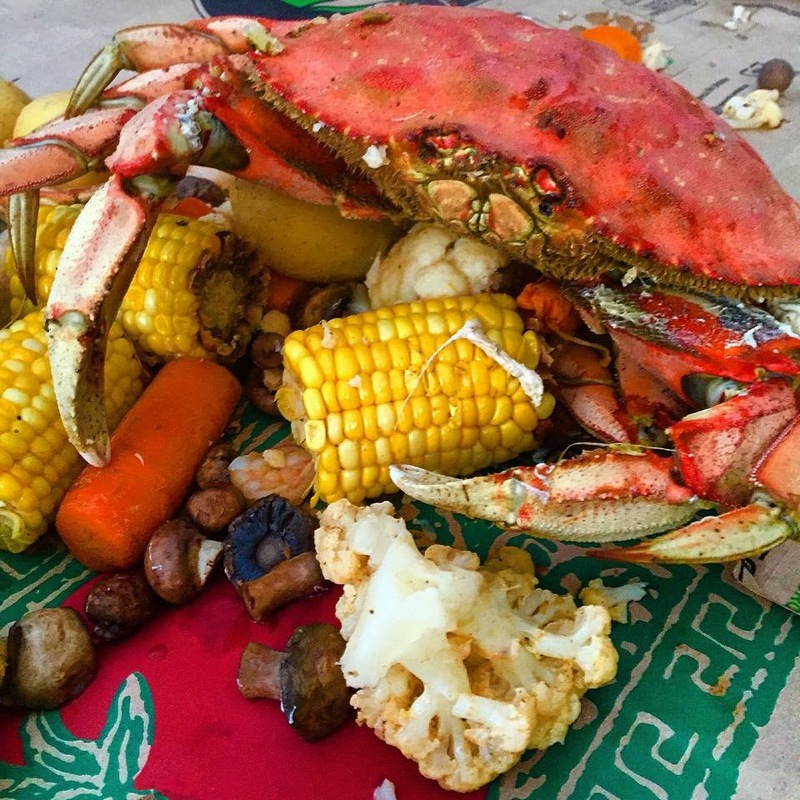 These crabs have a high meat-to-shell ratio and some of the sweetest available. Comes with a generous half a crab each guest. Thats over a pound of crab per person! All of our boils come with farm-fresh produce, shrimp, mussels, and our famous CDB remoulade sauce. Prices may vary based on market fluctuations. To book an event, please send an email to orders@crawdaddyboiler.com with your name, date of the event, amount of people to be fed, and contact information (phone number and email) or fill out this form and we will contact you shortly. For a calendar of available dates, check out our events calendar! How do i book a crawfish boil for my event? To book a boil, you can call us at (818) 263-6728, email us at orders@crawdaddyboiler.com with your name and the date of your event, or fill out this form. When the details of the event have been established and a menu has been decided on we require a 50% deposit to reserve the date of your event. The remaining 50% is due on the event date upon arrival. my party is tomorrow. Am i too late to order? We generally require at least 3 days notice in order to get your seafood, as it is shipped live. I have a question about seafood boils, who should i contact? We do accept check, cash or debit/credit. Once you have decided on a menu and a date, we will send you an invoice for 50% of your total event cost. We will hold your date upon receiving payment. i live outside the los angeles area, can i still book you for a boil? If you live outside LA we may still be able to bring our services to you, though a fee may be added depending on distance. Send us an email with your name, date and location of event, and amount of people to be fed - we will get back to you promptly. how is the food set up? will i need a table/utensils/plateware? We will bring paper food trays, napkins, utensils etc. If you require specific plate ware or utensils please let us know and we will be happy to accommodate. We also bring folding tables with butcher paper and large platters to present the food, but if you would like to use your own please let us know and we will work with you to make your event exactly as you envision it. I would like to change/cancel my order, how do i do so? We accept changes to orders 3 days before your event date or earlier. If you wish to cancel your event 3 or more days before the date, we will credit your deposit to the next event you book with us. do you offer additions to your boils, such as red beans and rice, or cornbread? If you would like to add additional food to your boil, or would like some suggestions of things you could add, please email your request to orders@crawdaddyboiler.com. I have a friend who is vegetarian/vegan/gluten free, will they be left out of the fun? Not at all! We prepare our boils in such a way that no animal products come into contact with any of our produce during the prepping or cooking process, thus ensuring all of our produce is vegan/vegetarian friendly. Our remoulade sauce contains egg, but can be made vegan for a small additional fee. All of our boils are completely gluten free.